In many seaports across Vietnam, it takes vessels about 15 minutes or less to enter or leave the ports even if businesses have already submitted dossiers online, Vietnam News Agency has reported. Dao Trong Hung, representative of HCM City-based Vietfrach – a shipping company, said that thanks to administrative reforms, especially online procedures, the company submitted few paper dossiers/applications at the ‘single window’ section when its vessels wanted to come or leave seaports. "It’s much simpler than previously to fill and submit maritime applications at the ‘single window’ - a system that allows businesses to declare information and submit documents in a standardised form once at a single location to complete all legal requirements concerning import, export and transit (regarding cargos, transport means and passengers)," Hung said. When time spent performing administrative procedures is reduced, businesses save hundreds of millions of Vietnamese dong per month on renting vessels, while costs for wharfs, berths, commuting and labour are also reduced. Le Van Thuc, director of Vung Tau Port Authority, said the port handles 30 administrative procedures relating to maritime activities and now, it takes business about 15 minutes to complete necessary procedures at the port. 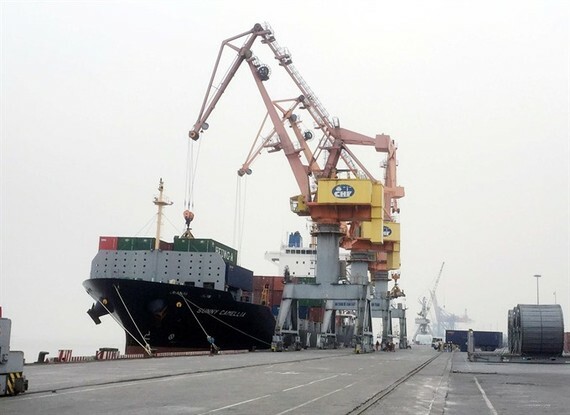 Now, once cargo arrives at port, goods can be loaded or unloaded immediately while previously, goods loading or unloading must wait until procedures are completed, Thuc said. He added that all procedures were publicised together as hotlines that allow applicants to contact heads of relevant sections if they have problems and want to complain. Nguyen Viet Khoa from a company that has vessels arrive at Vung Tau Seaport applauded administrative reforms at the port. “Now, both goods owners and ship owners can submit applications online before their vessels arrive or leave the port. So, time is saved,” he said. “We don’t have to go to the port to meet the port authority much. Instead, business contact relevant port officers via telephone and email to have registration work done,” he said. Ha Quang Thang, head of sea ship department under Hai Phong Port Authority, said that when online procedures were available, applicants did not have to go to offices of border guards, customs, health inspectors or animal quarantine to ask for permissions. Meanwhile, these agencies did not need to go the ship for direct inspections all the time, which helped save time and reduce costs. The port also implemented the Facilitation of International Maritime Traffic Convention and accepted international application forms to avoid overlaps that inconvenience applicants, Thang said. Director of HCM City Port Authority Nguyen Hai Nam said the port was implementing online administrative procedures but it could not grant online permission for vessels to leave the port because digital signatures were not implemented properly. Director of the Ministry of Transport’s Marine Department Nguyen Xuan Sang said that forms and information of all 107 maritime procedures available online, which business could fill in and submit 35 forms online while the others still required paper based applications. The 35 forms include 24 procedures on ship registration, six procedures on crew management and five procedures on sea ships. The five sea ship procedures are available on Vietnam National Single Window. “The Marine Department developed an online database on ships and crew which helps save time when handling dossiers from Vietnamese vessels,” he said. Sang said that the department continued to review and promote information and technology applications so more maritime procedures would be available via the national single window.